It was realised in the 1970`s that large scale collection of Mediterranean tortoises for the pet trade could be having serious effects on their populations. 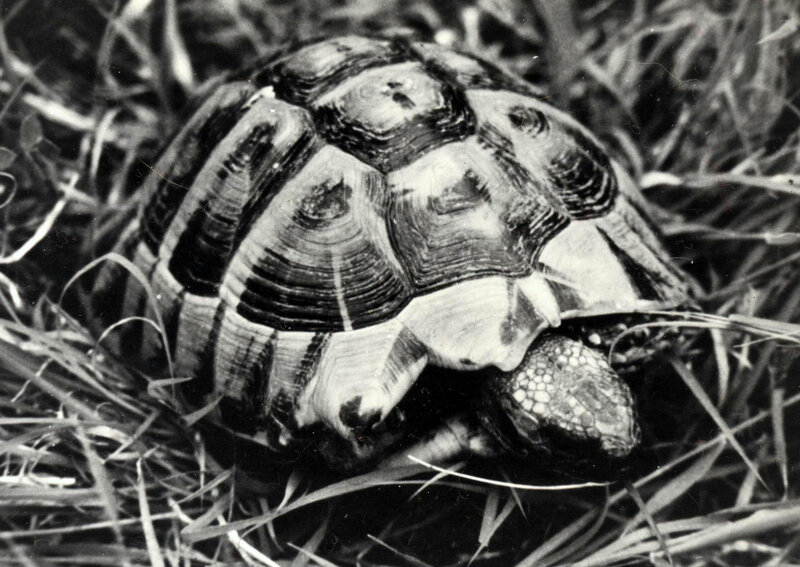 In 1967, for example, 476,186 tortoises from the Mediterranean region were imported into the UK (mean from 1965 – 1979 was 184,957 annually) despite no understanding of population dynamics or the effects of collection on wild populations. 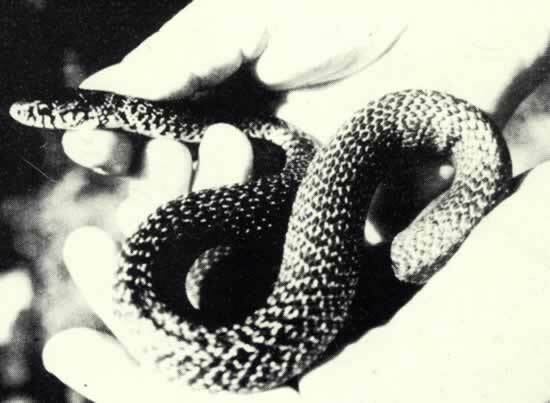 Mike Lambert of The British Herpetological Society was one of the first to alert the herpetological community to the problem. From 1969 Mike had surveyed in North Africa and Turkey in an attempt to ascertain the status of Testudo graeca and presented his findings at the 1980 European Herpetological Symposium held at Oxford University. He showed that collection for the pet trade had seriously impacted on the survivorship of adult tortoises in North Africa by reducing the abundance of T. graeca to 9% of previous levels. 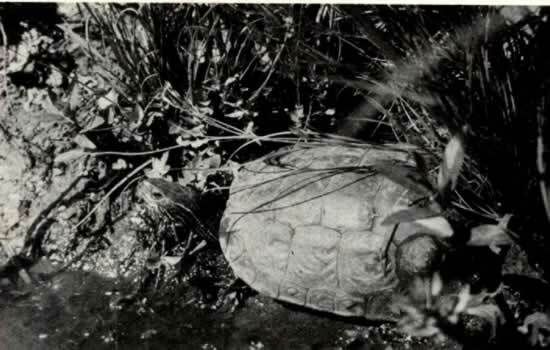 Our research on Testudo hermanni began in 1978 in Montenegro but was interrupted by a major earthquake in the region in 1979 and not resumed until 1983 as a solo effort, funded by the British Ecological Society. Information was also gathered on the glass lizard (Pseudopus (= Ophisaurus) apodus). 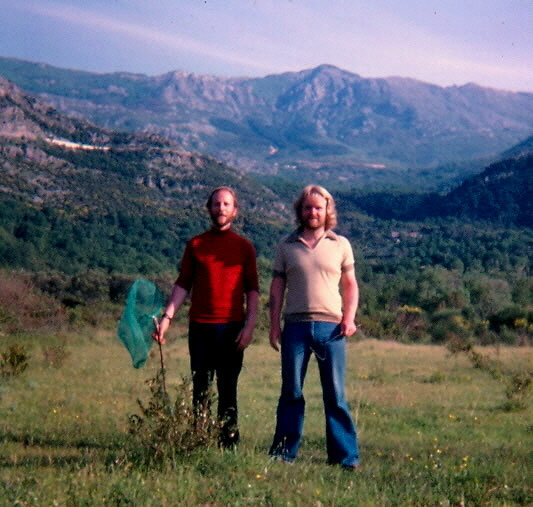 First fieldwork, 1978. 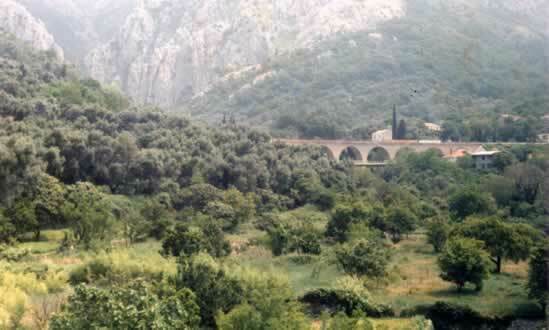 Here seen with Kenny Humpleby (left) the photograph shows typical tortoise habitat along the Croatian and Montenegrin coast. The habitat is formed primarily of approximately a 2km wide stretch of scrubland delimited by the Dinaric Alps and coast of the Adriatic Sea. Mediterranean scrub represents low cost thermal environment for thermoregulating reptiles; the open clearings enable easy access to sunlight for raising body temperature and the dense bush abundant shade for cooling. As a consequence most reptiles here thermoregulate precisely around optimum body temperatures, as the costs of doing so are low. In shaded forests (high cost) reptiles usually operate over a wide range of body temperatures since seeking out the limited sunlit patches for basking is ecologically costly. 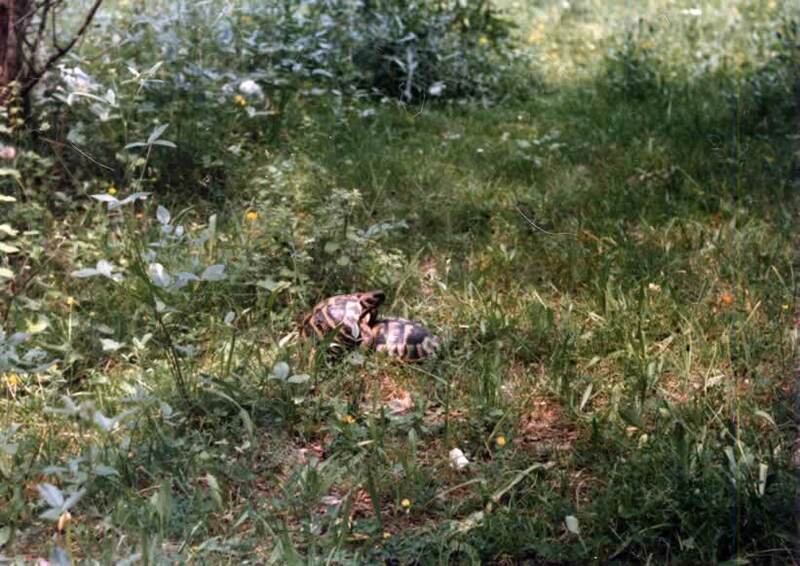 Tortoise and glass lizard habitat in Montenegro showing abundant basking and shaded areas. 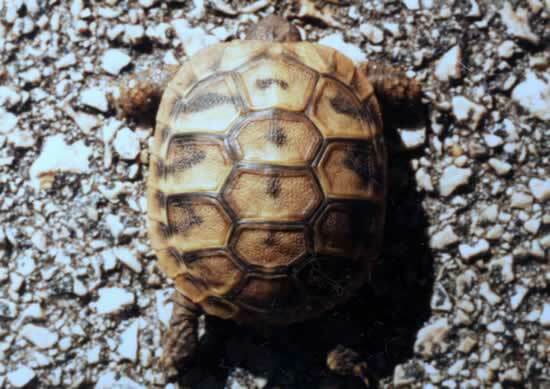 Body temperatures of Hermann tortoise typically reach 30 – 35˚C during spring and summer with glass lizards a little lower. Cooler autumn weather increases the time needed for basking, at least in tortoises. This problem particularly affects large female T. hermanni as a consequence of their low surface area to volume geometry and hence slower heating rates than the smaller animals including males. Details of thermal ecology can be found here pdf 20, 28, 29. Hatchling tortoises are around 10 – 20 grams when born and vulnerable to a range of predators. They are difficult to locate because of their small size but also perhaps due to selecting different habitats from the adults. I once found a cluster of yearlings in a very small area, which was dominated by long grass. This might have given a degree of cover from predators whilst allowing sunlight penetration for raising body temperatures. Young tortoises when born have no growth rings and deposit their first ring during the period of no growth during hibernation (rather like trees). However their chances of survival to adulthood are low with mean annual recruitment into the adult population around 3 – 5 %. 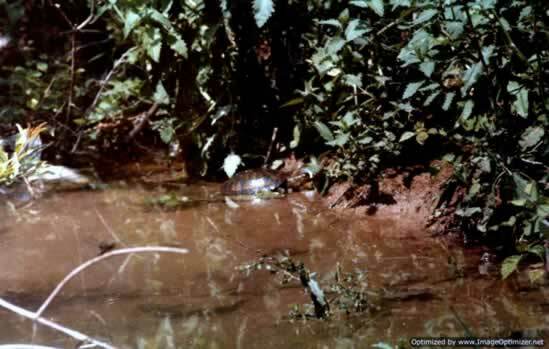 The more active male tortoises were usually detected by the noise they made when moving through the undergrowth. Additionally, they court females by retracting the head and butting the female, a sound that can be heard at some distance. 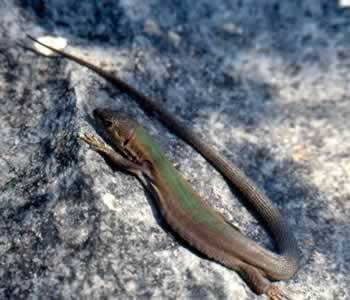 They were often seen sharing basking sites with glass lizards. Histogram of body temperature frequencies of Hermann`s tortoises when feeding. 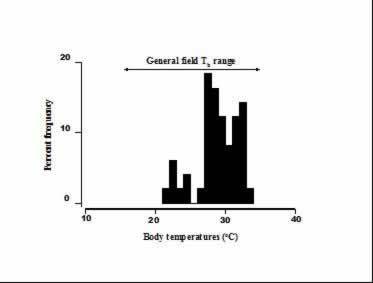 The horizontal line indicates the overall range of body temperatures (general Tb range). Body temperatures selected for feeding ranged between 21 – 34˚C with a peak between 28 - 29˚C. Feeding occurs after a period of morning basking to elevate body temperature but the basking period is extended as the weather cools in autumn and hence less time is available for feeding and other activities. The Glass Lizard Pseudopus ( = Ophisaurus) apodus. This is Europe’s largest species of lizard growing to over 1.2metres. It is an armoured legless reptile with bony elements within the scales that are an effective anti-predator mechanism. 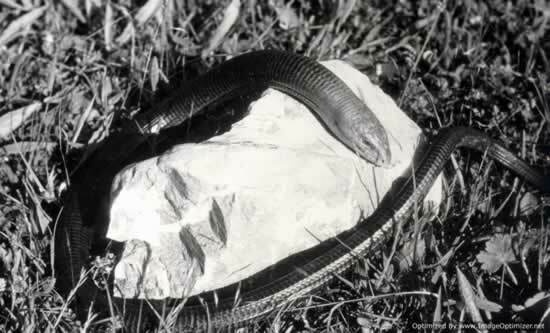 The glass lizard is one of the many legless forms in the family Anguidae. In Europe it is found in the eastern area of the continent in a range of habitats. On several of the study sites we also found the only other European anguid lizard, the slow worm Anguis fragilis. The lifestyles of the two species are very different; the glass lizard is a cruising forager highly visible during the daytime whilst the slow worm is a secretive species mostly living under flat stones and pieces of wood. Both are carnivores feeding on invertebrates but the glass lizard may consume vertebrates, including rodents and young snakes although apparently beetles and snails are the most frequent prey items. Two species of legless lizard, the glass lizard (top and lower left) and much smaller slow worm, Anguis fragilis (below right). The effectiveness of the heavy scaling as an anti–predator mechanism in the glass lizard can be seen in the photo on the lower left that shows scale damage most likely sustained from predator attacks – perhaps domestic cat. The slow worm relies for defence on its secretive lifestyle. 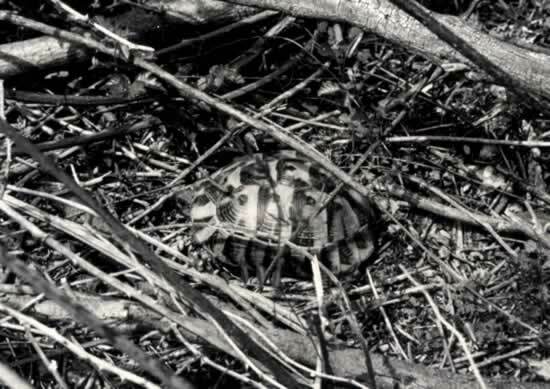 It is preyed on by several species including whip snake (Hierophis (= Coluber) gemonensis). The slow worm is more widely distributed of the two and occurs in a variety of climatic conditions including the UK. It has a rather complicated thermal biology. A paper on thermoregulatory behaviour in the UK can be found here pdf 51. The above graphs represent daily activity in Hermann`s tortoise and glass lizards based on capture frequencies of active animals and indicate glass lizards are active for longer during the daily period than sympatric tortoises. One possible explanation is that glass lizards must search for active prey while tortoises feed on plants that are easier to harvest. This enables more rapid stomach filling in tortoises reducing foraging time. Herbivorous reptiles, however, require high body temperatures to digest tough plant material, and may partly explain why tortoises maintain higher body temperatures than the lizards. Also apparent from the graphs is bimodal activity in summer (and to a lesser extent in spring in T. hermanni) and unimodal activity in cooler autumn weather in both species. Glass lizard activity in cooler weather, including periods of light rain, may optimise contact with certain types of prey, for example, snails and slugs that are active after rain. However, low body temperatures, and hence lower velocities, increases the danger of predation but dermal armour reduces the risk. Two papers on glass lizards can be downloaded here pdf 24, 25. 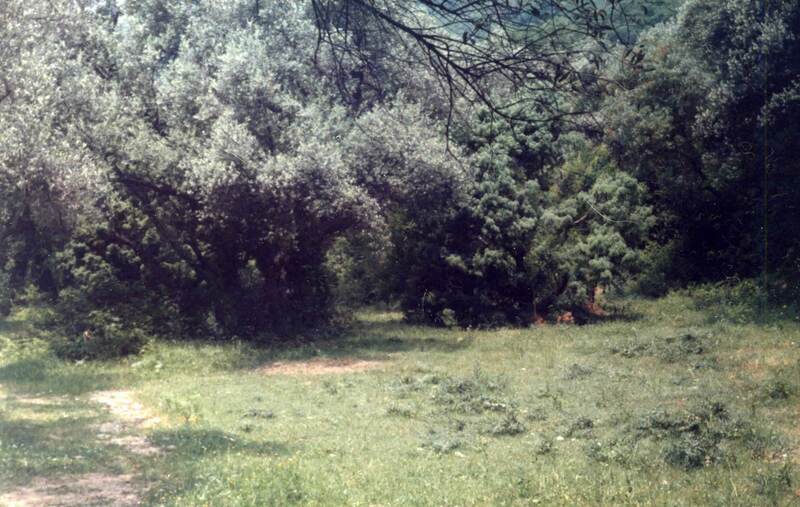 This study area in southern Montenegro, near the Albanian border had some of the highest densities of glass lizard and Hermann’s tortoise. It differed from the other study sites in that crops were grown in the adjacent fields and although many types were those fed to captive tortoises there was little evidence of wild tortoises attempting to eat them. There was also no evidence of the locals being hostile towards tortoises (as was claimed by the pet trade at one point). Glass lizards were, however, thought of as snakes by local people and occasionally killed. Theoretically if reptiles are attempting to thermoregulate to optimim temperatures they must spend time in the sun to elevate body temperature when environmental temperatures are below preferred levels and seek shade when body temperatures are high to avoid overheating. They must therefore respond to changes in body temperatures by selecting microenvironments that enable optimum body temperatures to be maintained. This notion can be tested by comparing real reptile behaviour with what would be expected in a hypothetical random moving non-thermoregulator. In an environment with approximately equal amounts of shade and open areas, random movement would result in spending approximately 50% of time in each area, irrespective of body temperature. The graph above shows hourly mean body temperatures (Tb) plotted against percentage time that either Hermann`s tortoise or glass lizards spent in open sunlit areas (Po) in such an environment. The predicted movement of the hypothetical non-thermoregulator is represented in the graph by the dotted line (see below for how this was calculated) and the continuous lines derived from regression equations calculated from data on tortoises (open symbols) and glass lizards (solid symbols). The regressions for the real reptiles indicate movement in open areas when body temperatures were low but retreat to shaded areas when they reached around 30˚C to avoid further increases in Tb. Po = -3.260.79Tb+146.4 (t = 4.01, p = 0.01). The regression coefficients are thus what are expected in a thermoregulator, but for evidence of thermoregulation they must depart significantly from the 0 coefficient, which they do as indicated by the t-tests. An alternative method to generate a random model from y and x variables has been described by Gotelli & Ellison (A Primer of Ecological Statistics, Sinauer Associates Inc. Sunderland, Massachusetts, USA). In this the observed y-values are redistributed randomly and re-attached to the x-values to represent a no-effect of x on y (in the above example this would be a no effect of Tb on microhabitat selection Po). After 5000 random reshufflings (you would really need a computer to do this) they generated a regression coefficient of -0.002 (almost exactly 0) as a null coefficient. 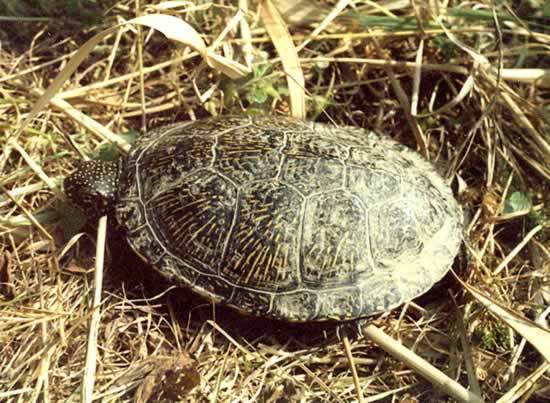 Top photograph shows a European pond turtle, Emys orbicularis. This animal was found crossing a grassy clearing, presumably changing ponds, but more often they were seen basking (lower left). On one occasion the shell of a dead individual was found on a clearing suggesting overland movements may be hazardous. Caspian pond terrapin, Mauremys rivulata (bottom right) was one of several basking on the banks of a ditch in Montenegro alongside both pond terrapins and water frogs. Green lizards Lacerta trilineata and Lacerta viridis. The giant form L. trilineata (left) was common in most scrubland areas close to the coast and L. viridis on rocky hillsides. The animal on the right is a subadult L. viridis in classical basking position with the body flattened to maximise heat gain. Basking in dappled sunlight under vegetation renders it less visible to predators. 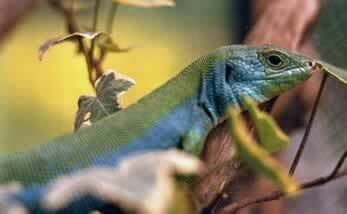 The photograph of L. trilineata shows a male with the typical blue colouration frequently seen on all types of green lizard, including females. Marsh frog Pelophylax ridibundus (left) and southern toad, Bufo bufo spinosis. 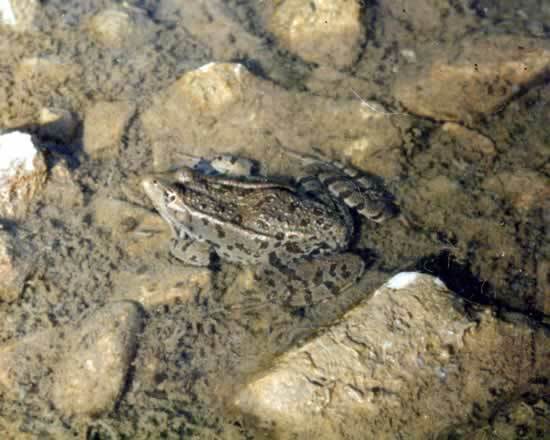 The water frogs are common throughout Europe and the marsh frog is the largest species (snout to vent length can be over 140mm). It was abundant in most places where there was water. 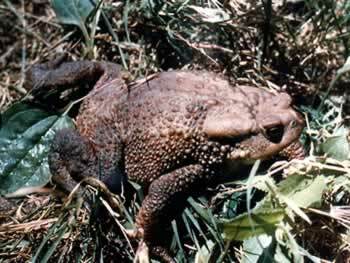 The southern toad is a subspecies of the common toad but grows much larger. The animal in the photo had a snout to vent length of 144mm and body mass of 472grams. They are usually nocturnal but this individual was found during daytime moving through scrubland. The paratoid gland that contains a poison for use as against predators can be clearly seen behind the eye. Whip snake, Hierophis gemonensis was the commonest snake we encountered, usually when foraging. Several captured animals regurgitated recently eaten prey, which was mostly lizards including the legless lizard Anguis fragilis. They feed on a wide variety of animals including grasshoppers and small mammals.